Oral History NSW members regularly monitor evolving technologies suitable for use by oral historians. This information is made available through this website and our monthly newsletter Oral History Network News. Care is taken to ensure that the details are accurate at the time of publishing, but this cannot be guaranteed as both models and prices change regularly. Please share your experience and advice with others - email us at at membership[at]oralhistorynsw.org.au. For quality recordings of lasting integrity, we advise you to buy the best equipment you can afford, rather than the cheapest. Help is as close as the internet. YouTube is a wonderful resource where you can find demonstrations of many aspects of digital recording. Another useful website is eHow (how to do just about everything). Type in your recorder’s name and you'll find hundreds of videos submitted from different sources (not just the manufacturers) talking about the pros and cons of each. Prices included are an indication only and will vary from store to store. The Zoom H5 is the more recent version of the Zoom H4n. New features include rotary dials for adjustment of recording levels, and interchangable microphone modules. 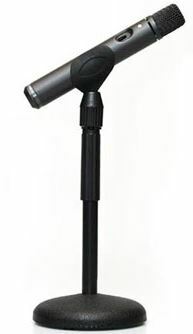 All the other specifications that led us to recommend the Zoom H4n remain in the Zoom H5, such as as the robust pair of XLR sockets for external microphones, phantom powering of external condensor microphones, and sampling at and beyond the recommended sampling rate of 48 kilohertz, 24 bit. Oral History NSW reviews of digital field recorders (Feb 2011, Feb 2013) ranked the Zoom H4n as an excellent choice for oral historians looking for appropriate sound quality levels, ease of use and value for money. One of its best features is the robust pair of XLR sockets for external microphones. These same sockets can also be used with 6.25 microphone plugs. The Tascam DR-40 has all the features of the Zoom H4n with an additional feature of being able to simultaneously record the same sound file twice – once at the original recording volume, and the other at a lower volume. This can get you out of trouble if there is a sudden peak of recording level that might distort the sound recording. 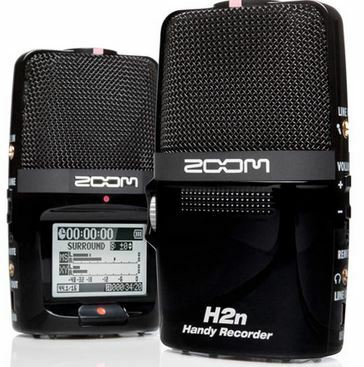 If the budget doesn’t allow for external microphones, then the Zoom H2n is a good alternative to the H4n as the recording device can be placed between the interviewer and the interviewee and the built-in microphones can pick up sound equally from opposing sides of the recorder. For those with a very limited budget the Zoom H1 offers simplicity of use and value for money. However, although it has a pair of built-in microphones, it has only one socket for external microphones and therefore use of external microphones requires a split cable adapter. Note: for both the Zoom H1 and H2n it is important to also purchase the Accessory Pack for the essential tripod. Pack also includes windshield, AC adaptor (USB type), Soft Case, USB cable and microphone clip adaptor. A stereo recording module for iPhones and iPads with a Lightning connector. If you are using an iPhone or an iPad to record, a microphone module such as the Zoom iQ6 will give a better result than using the microphone built into the device. On most digital recorders, audio is stored on SD cards or Micro-SD cards, similar to that found in most digital cameras and some mobile phones. SD cards are not all created equal. Some poor quality cards may work in cameras but a quality card is required for audio and video recording. The amount of data that can be stored per second varies from card to card and is defined by a Class number, written on the card with an almost complete circle. Class 1 is the slowest with Class 10 being the fastest. Class 4 is considered the minimum required for sustained audio recording. If no class is indicated on the card, then it is probably unsuitable for audio recording. Use only quality brands such as Sandisk and Verbatim. One basic rule of recording is that the recording cannot possibly produce better sound quality than the microphone is capable of delivering. Recording quality begins with the microphone. 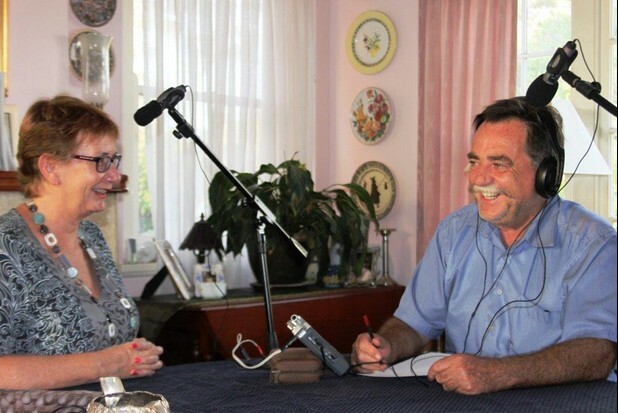 An extremely versatile microphone that opens up possibilities for anyone who records audio – from oral historians, journalists and students, to business people adding files to websites and multimedia presentations. Note: Stand and microphone cable must be purchased separately. A pair of good quality headphones that cover your ears are recommended because they allow you to hear if the recording is distorted or clear and whether there are unwanted background noises that may not be discernible with your ears alone. Even if you do not intend to wear the headphones during the entire interview, they should be used, at least briefly and perhaps at intervals to check sound levels and possible background noise or interference. There is a huge variation in the prices of headphones and rarely is anything below $100 of sufficient quality. An exception is the Sennheiser HD201 which is available from VideoGuys and Turramurra Music for around $50. These give good quality sound and are comfortable enough to wear for long periods of time. Recommended brands include Sennheiser, Sony, Bose, Audio Technica and Beyer. It is preferable to find a shop that will allow you to preview the headphones before purchasing because although quality is important, comfort is also a consideration. Audacity - very useful free downloadable software for audio editing. This is the editing program cited in the Oral History NSW Introduction to Oral History workshops. Audio playback control software for PC, MAC or Linux designed to assist the transcription of audio recordings. Installed on the typist's computer it is controlled using the keyboard (using Hot Keys) or foot pedal, sold separately. The software is free for personal use, $24.99 for professional use. Express Scribe can be used to play and transcribe ordinary WAV or MP3 recordings and includes its own Dock feature to transfer recordings directly from portable recorders. Type using any Windows word processor. Offers valuable features for typists including variable speed playback, multi-channel control, playing video, file management, and more. PRODISC – the preferred choice of used of Libraries and Archival Oral History Collections around Australia. All discs carry the Gold Plated Data Protection certification label and are printable using inkjet. PRODISC are the sole suppliers of these highly commended quality products. Selecting the correct type of discs for your needs is important. If in doubt check with PRODISC’s specialist staff. For accurate low – medium speed recording – real time 650 megabytes (74 minutes uncompressed). For critical archiving, preservation, audio/video mastering, photography and oral history. Note: these discs cannot be played in a CD Player. High quality, archive specifications, 9mm thick unbreakable, flexible, single CD mailer with clear plastic overlay wrap for external slick and provision of booklet inside. Only available from ProDisc Systems Australia, order online.